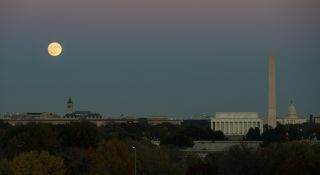 A nearly full supermoon full moon rises over Washington D.C. in this photo by NASA photographer Joel Kowsky captured on Nov. 13, 2016. On Nov. 14, the moon is at its closest to Earth until 2034. The November "supermoon" is extra close to Earth today (Nov. 14), providing an extraordinary sight for skywatchers — but exactly what makes this month's full moon so special? November's supermoon —a term used to describe a full moon is at its perigee, or closest point to Earth during the lunar orbit — will be the biggest and brightest supermoon to rise in almost 69 years. In fact, the full moon won't come this close to Earth again until Nov. 25, 2034. The nearly full supermoon Beaver Moon rises over the Syr Darya river near the Baikonur Cosmodrome spaceport in Kazakhstan on Nov. 13, 2016 in this view by NASA photographer Bill Ingalls. By definition, a supermoon "is the one closest full moon of the year," Petro told Space.com. The distance between the moon and the Earth changes because the moon does not orbit in a perfect circle. "The main reason why the orbit of the moon is not a perfect circle is that there are a lot of tidal, or gravitational, forces that are pulling on the moon," Petro explained, adding that the gravity of the Earth, sun and planets of our solar system all impact the orbit of the moon. "You have all of these different gravitational forces pulling and pushing on the moon, which gives us opportunities to have these close passes." What's more, the surface of Earth is about 70 percent ocean, which not only affects the moon's orbital pattern, but in turn creates tidal variations on Earth. This year, slightly higher tides are expected in relation to the Nov. 14 supermoon, although this is nothing unusual for close full moon approaches, Petro said. "One of the interesting things about the moon is that it's not only pulling on the Earth's oceans, it’s actually pulling on the Earth's crust," Petro said. "The Earth's crust — the land beneath our feet — actually deforms and responds to the moon" in a very subtle way. "We're not talking about dramatic shifts in distance, but were talking about subtle differences that are noticeable if you're used to looking at the moon," Petro said. Tonight's supermoon will be approximately 221,524 miles (356,508 kilometers) from Earth. While this is the closest full moon to rise since Jan. 26, 1948, it is not the closest full moon approach on record. In January of 1912, the full moon was "just under 100 kilometers closer than the full moon" tonight and the supermoon of November 2034 will be even closer, Petro said. The November supermoon reaches perigee this morning (Nov. 14) at 8:52 a.m. EST (1352 GMT). When the moon is this close to Earth, distinctive lunar surface features such as impact craters can be seen with the naked eye.